Our next destination – a last-minute add-in – was the (mostly) all-inclusive beach resort of Varadero. Despite the all-inclusive lure, you can still get casas here. Ours was right at the other end of the strip to the massive hotel resorts, and we liked it that way. If you’re coming from Trinidad, going by car is quite expensive (we were charged CUC 80* total for the car, but if we had found two extra tourists we could have split the price with them), so you may want to look at getting a Viazul bus. On arrival, our driver managed to find the right street, but drove up and down the road about three times trying to find the right place – it was tucked away and slightly off-road. Once settled and having swatted a few mosquitos (the first we’d seen on the trip), we set off for the beach, which we were pleased to find was right on our doorstep. 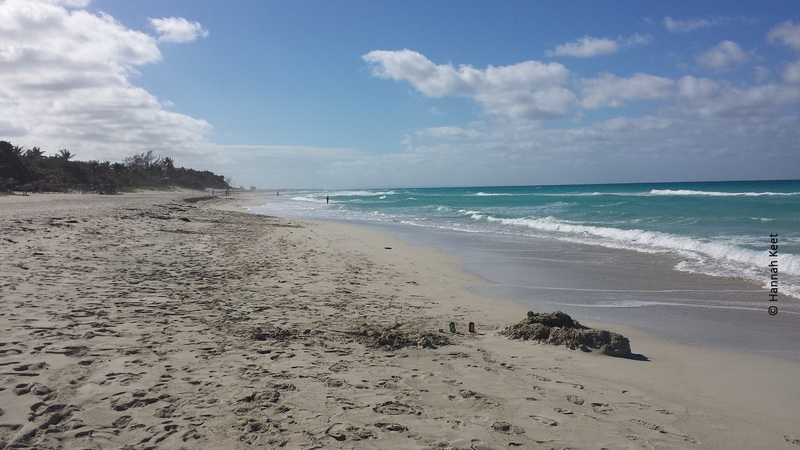 The beach in Varadero is so vast that not every part is “policed” by people wanting money for sun loungers, so you can just pick a secluded spot and put your towel down. Varadero boasts a hop-on hop-off bus tour, but if you’re not staying in the hotels at one end of the beach and wanting to come to a different part of the strip, it’s really, really not worth getting on it – trust me from personal experience! Varadero is exactly what it says on the tin: a beach resort. There are a few boat trips on offer, they have a dolphin park, and a few other small sources of entertainment, but don’t expect to come away from here with much other than a tan. If you’re flexible in your trip planning, don’t go on a day when it’s raining, as you will most likely be bored. 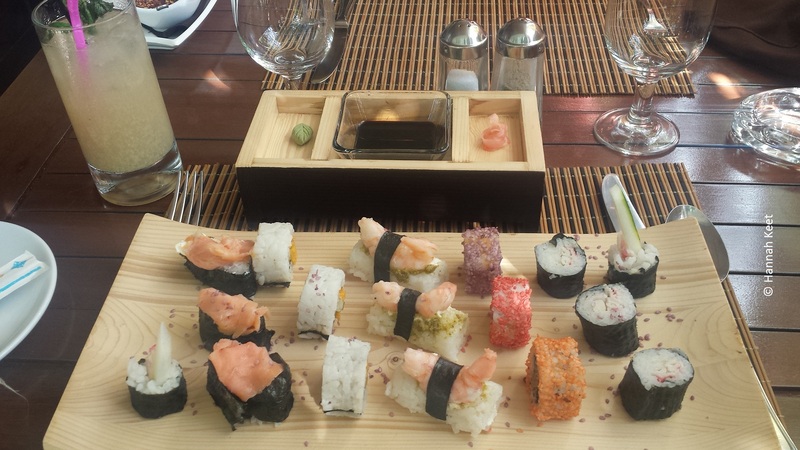 The things I liked most about Varadero were two of the restaurants we visited – Barbacoa, a steak house, and Salsa Suarez, which featured sushi on the menu (both to my utter delight as I love sushi and my utter surprise as Lonely Planet said this restaurant did cheeses). Picking restaurants as my favourite thing may seem a bit odd, but food in Cuba can be somewhat bland, so these two places really stood out. The food wasn’t an issue for the first 7-10 days of our trip; I was thoroughly enjoying the pure taste of lobster, shrimp, and fish. I even wondered what people were talking about: the food was lovely, not to mention plentiful. It is… but after 10 days of eating the same sort of thing, it gets a bit repetitive. If you’re staying in a casa particular, breakfast will inevitably consist of eggs ­­(either salty fried eggs or an omelette ) and fruit. After about 10 days of eating eggs – I don’t even like eggs, but the British politeness in me meant I couldn’t refuse food from these lovely people – I dashed off to the local supermarket to buy cereal, tapping my foot impatiently outside the shop as they were 10 minutes late opening in the morning and my belly was rumbling. I also loved the casa del Ron, a shop selling every flavour of rum you’d ever imagined. They give you as many free samples as you ask for in the hope that you’ll buy a bottle or two. I opted for the pineapple as a souvenir for my dad, who when sharing it with friends and family, told them it was banana (“well… it’s a yellow fruit, isn’t it?”). The things I didn’t like about Varadero were two of the other restaurants we visited: Dante (extremely slow service and food that didn’t taste nice. Thanks for recommending them, Lonely Planet!) and Casa de Fondue (our waiter was obnoxious and we didn’t realise that fondue didn’t automatically mean cheese; this had to be ordered separately. What I actually ended up with was a plate of raw chicken that I had to cook myself in a vat of sizzling fat and three dips, none of which went particularly well with chicken). The aforementioned bus tour was also quite poor. In addition to it being boring, it halted abruptly at one end of the peninsula at 12pm as the drivers were off for their lunch.